Ideal Views of the Primitive World, in its Geological and Palaeontological Phases. London: Printed by Taylor and Francis, . 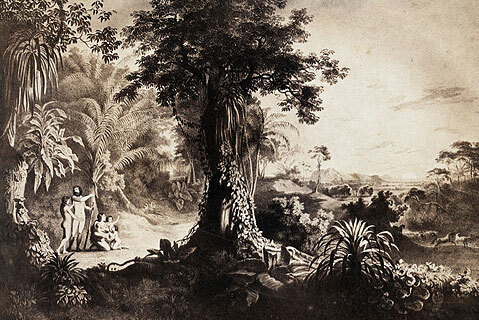 In a series of 14 plates, Unger depicts the history of life on earth; one illustration shows the ferns of the Coal Period, another some dueling dinosaurs of the Cretaceous, yet another the cave bears of the Ice Age. But humans appear only on the last plate, depicting “The Alluvium,” or the earth in its final phase. 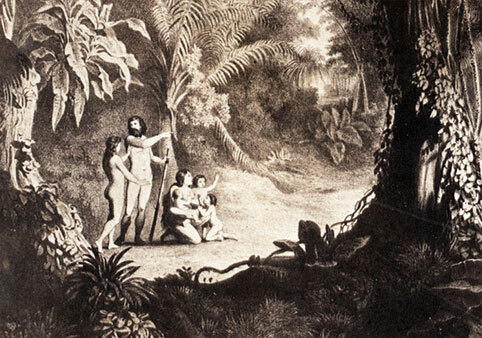 The setting is quite Edenic, and the figures clearly represent Adam and Eve and their descendants. In this scheme, humans have no presence at all in the prehistoric world. It is ironic that, in the year of this book’s publication, arguments for the antiquity of humankind will for the first time begin to persuade the opposition.